It’s the first Wednesday of the month and that means it’s time for a fun blog hop! 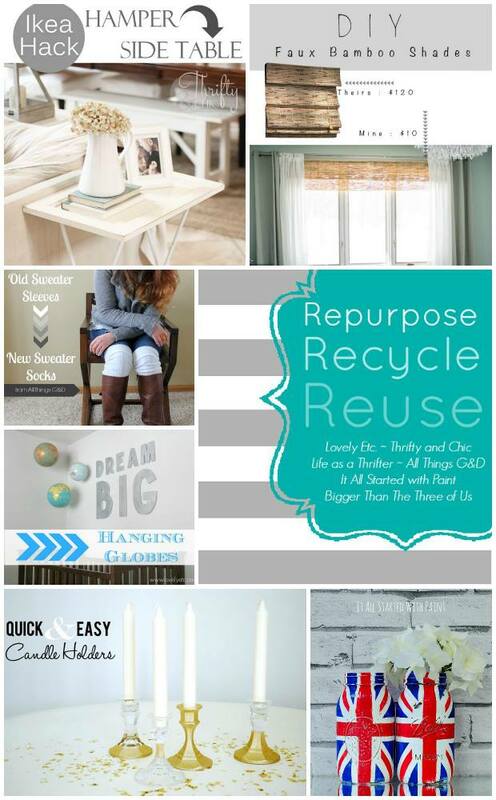 The goal of this blog hop is to “Repurpose, Recycle and Reuse” and boy do I have something fabulous for you today! 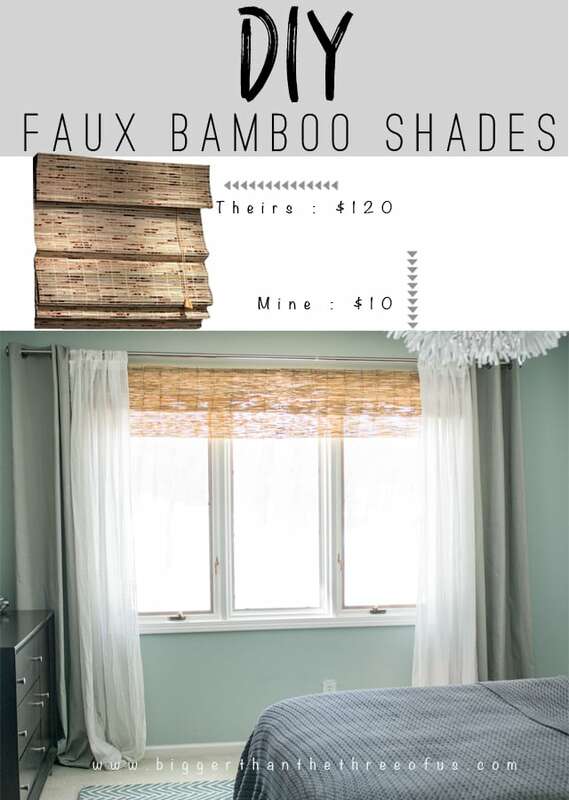 I made some DIY Bamboo Shades and am LOVING THEM! So, if you know me in person, then you know that I can be a bit cheesy. Seriously, I’ve told Luke in a super-giddy voice all week how in love with this project I am. Then on Monday, I finished up part of it and I sent him a quick photo text saying “I’m a bonafide genius”. Sometimes, I just get so excited about something and it comes out cheesy. So, fair warning, I’m super-excited about this project. 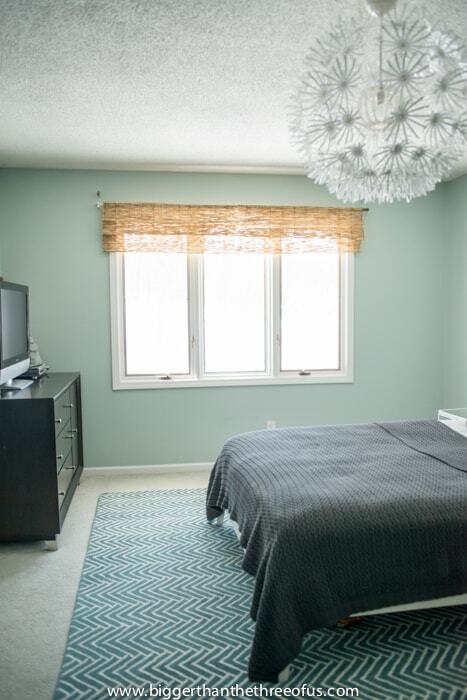 We finally decided to finish our bedroom. It has sat in it’s current state (about 75% done) for the past 6 months’ or so. 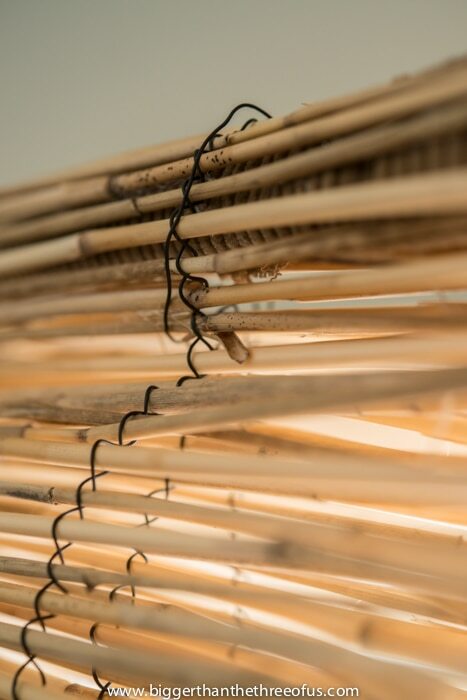 One of the things that we needed to finish it was bamboo shades to cover our roller blinds. 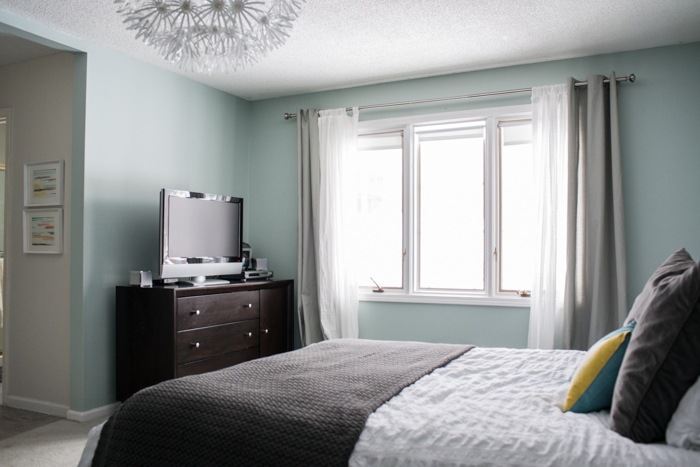 I love our roller blinds because they are so easy to put down at night and put up in the morning. However, they are not easy on the eye… they are downright ugly. 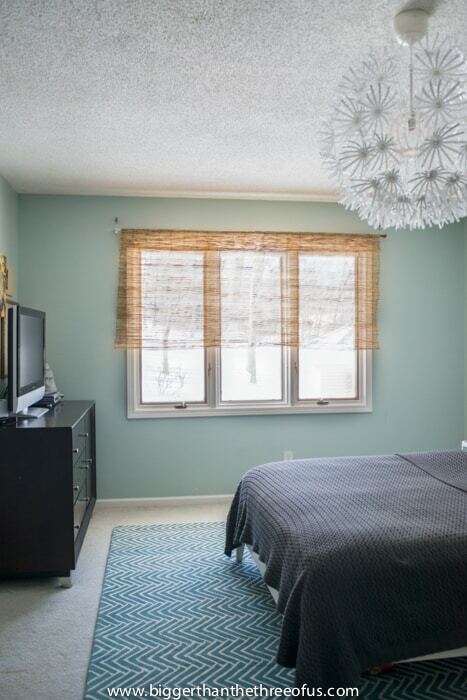 So, I wanted to do a bamboo shade as a cover layer for the window (like what we have in our formal dining room below). 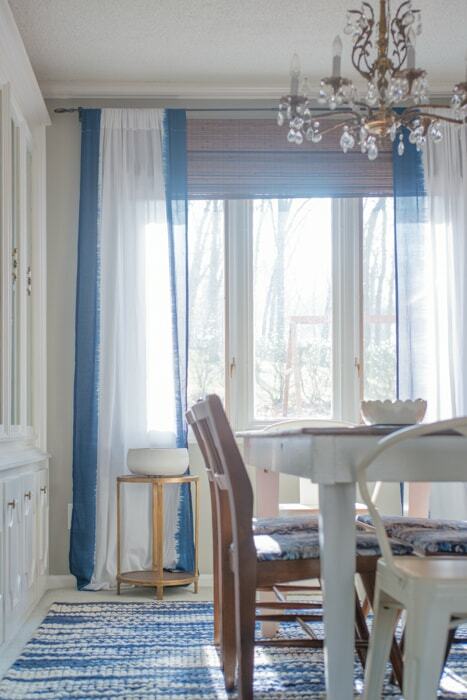 I have never lowered the shade in the formal dining room (even though they are real ones that can be lowered), so I knew that wanting to lower them would never be a problem. I needed over 82 inches wide (so I bought two at 42 inches) and the subtotal came to just over $120. Holy Mackarel. Do you immediately see what I see? Yep, it says fencing, but I see bamboo shades. I quickly scooped up the small roll for $9.99 and checked out. 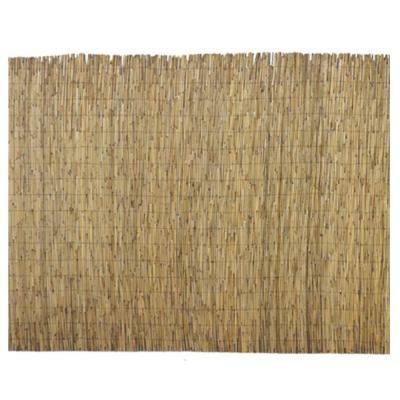 As soon as I got home I got to brainstorming on how to actually make it into a bamboo shade. Ready for a tutorial? Here goes. 1. Gather your supplies. 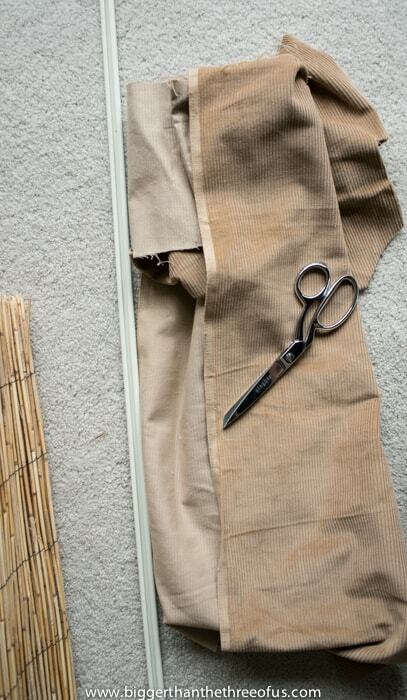 You will need: bamboo fencing ($9.99), scrap fabric (that halfway matches the fencing), a glue gun, scissors and a curtain rod. 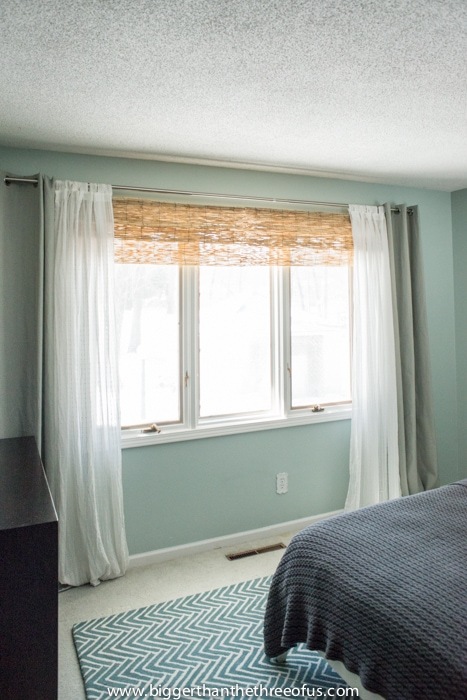 I had the curtain rod in our basement but, if you don’t have one, these old styles can be picked up at the Habitat Restore for $2. 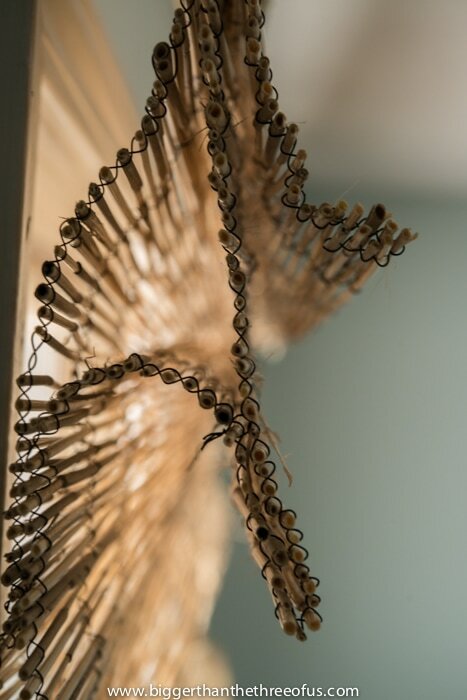 You could also make a wood hanger or use a dowel rod to hang it from. You could be creative here. 2. 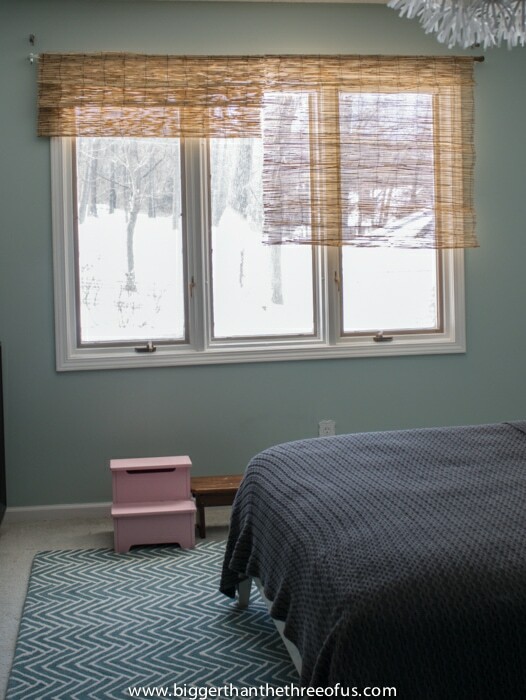 Measure your window (I wanted an outside mount so I accounted for extra) and cut the bamboo. 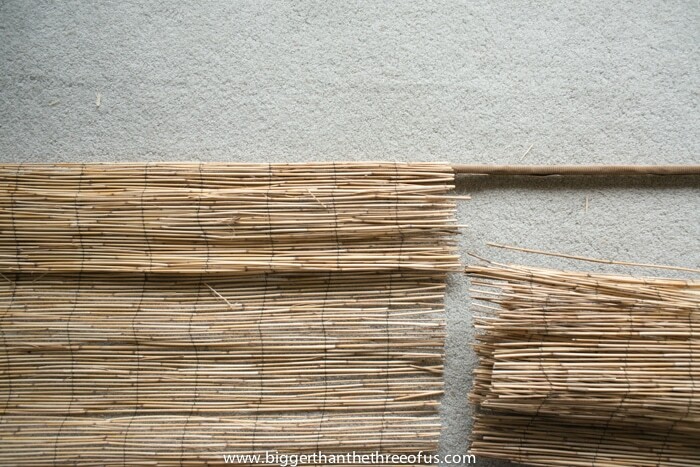 The bamboo fencing cuts easily with a pair of scissors. 3. Hot glue scrap fabric around the curtain rod. 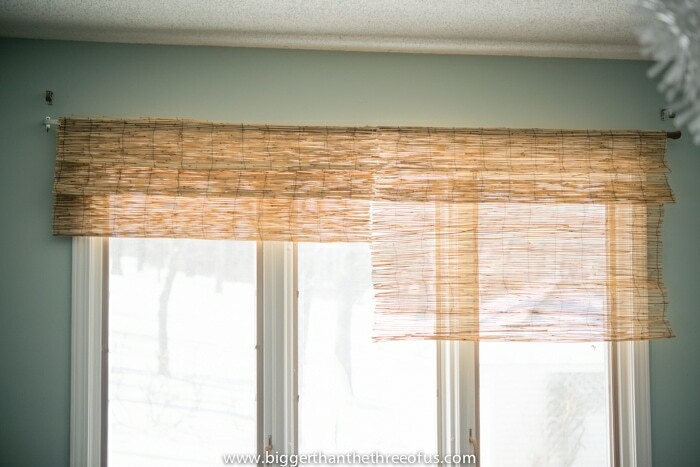 You are doing this so the white curtain rod doesn’t show through when you hang the bamboo shade up. 4. 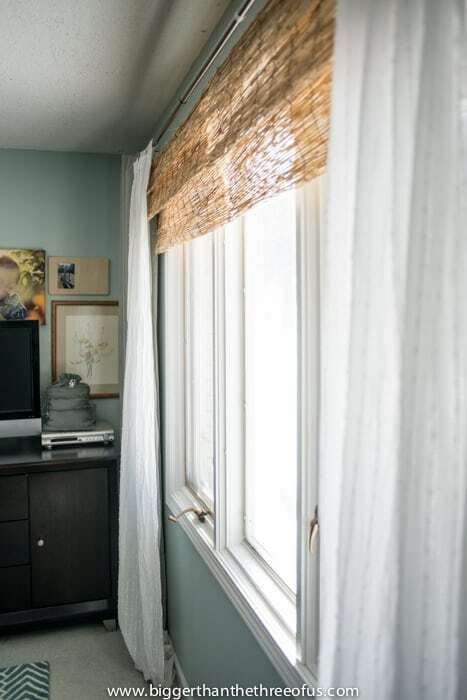 Place your curtain rod over your bamboo about 8 inches (this accounts for the fold over the curtain rod). 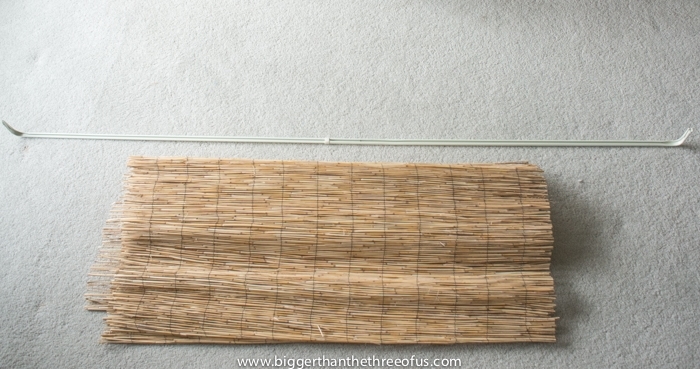 Gently fold the bamboo over the rod and check to see if you like the amount of bamboo that you have hanging (this is the top of your bamboo shade). 5. 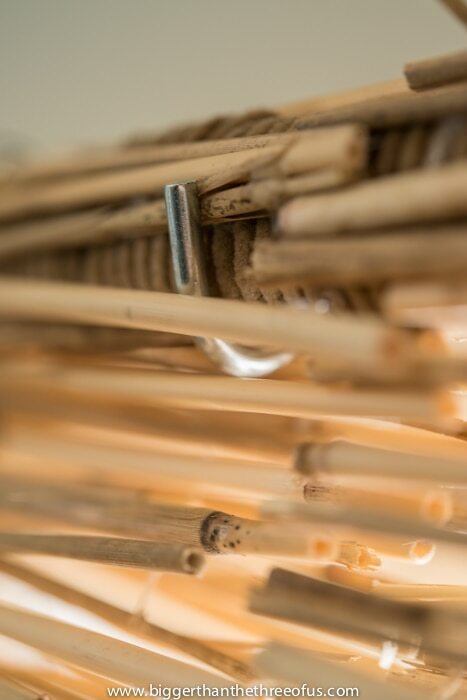 If you like the amount of hanging bamboo, then hot glue the bamboo to the rod. 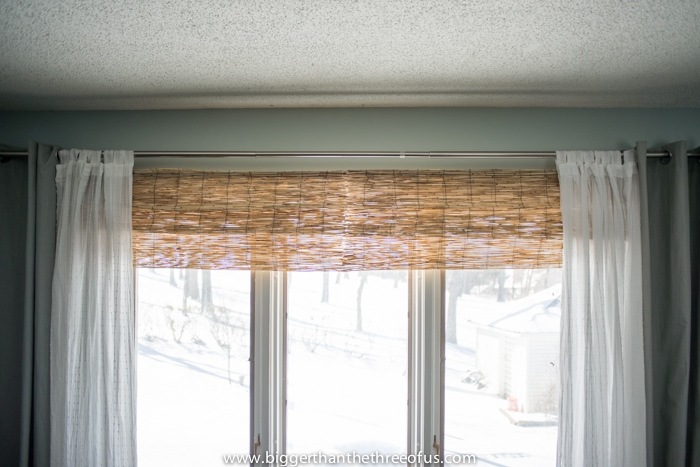 I don’t have a picture of this, but make sure to overlap your second piece of bamboo (if you have an oversize window like me) so that your bamboo shade looks seamless. I overlapped about 1/2 inch. 6. 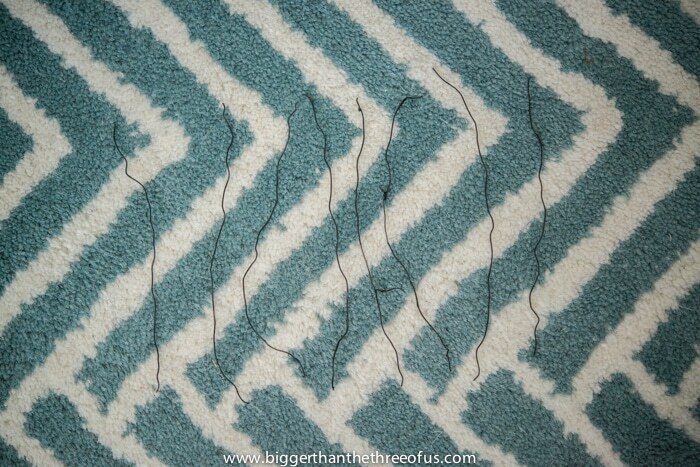 Hang your rod up so that you can determine where you would like your folds to be. 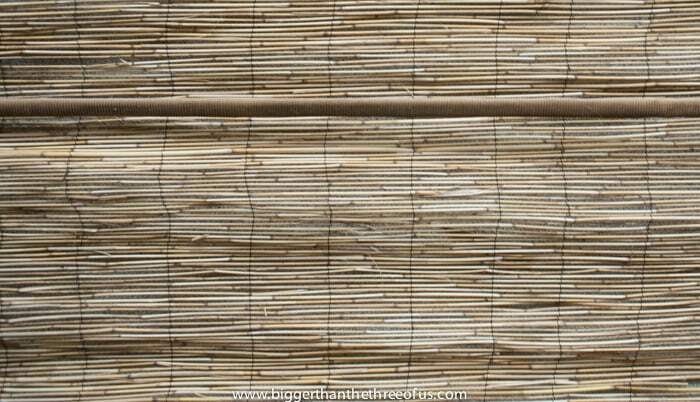 Once we got the rod up, the weight of the bamboo fencing (which isn’t much) made it sag. We had a long cup hook and we screwed it in to help support the weight in the middle. 7. 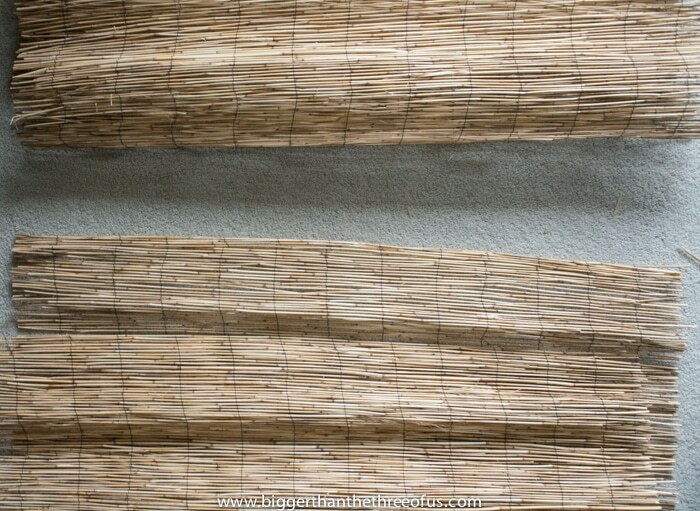 Using wire from where you cut your bamboo shades, separate it and cut it in to 5 inch pieces. 8. Gently bend your shade where you would like your bend to be. 9. On the seams (I did every other), wrap wire from the front of the fold to the back piece to create the fold. You can see the extra wrapped wire in the picture below. 10. 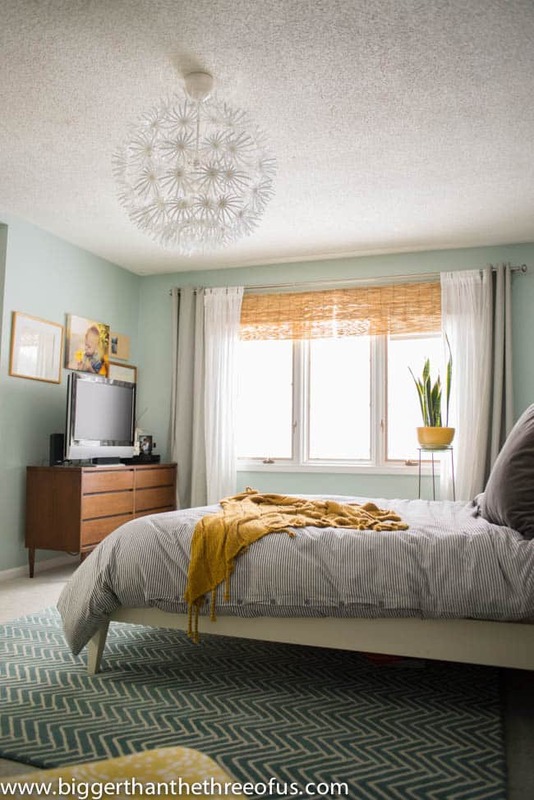 Once you get to the second shade (if you have an oversized window), keep in mind that you are trying to match the folds. This wasn’t hard. I eyed up close and then took a few steps back to make sure I was on track. 11. 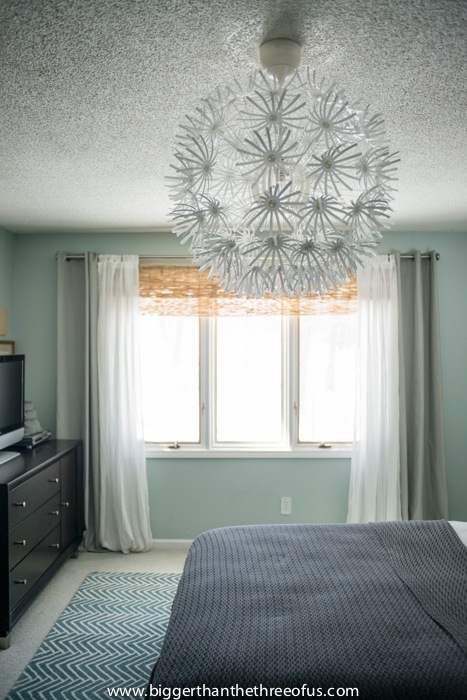 Layer your curtains high and wide over the bamboo shades to create a more layered look. 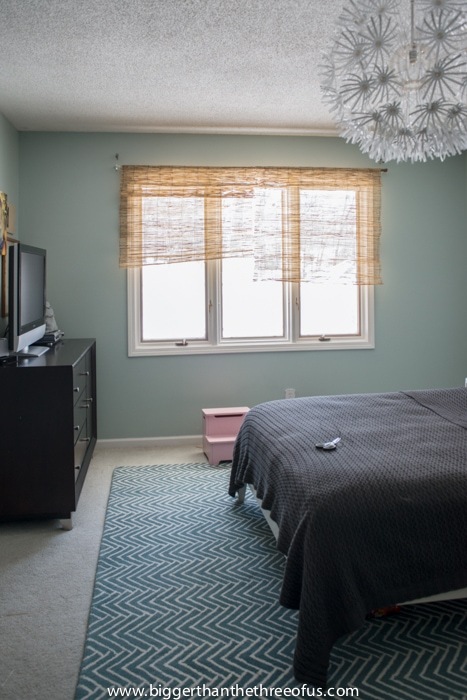 *Edited 04/13/2016: Check out the master bedroom reveal or the calm and refreshed bedroom. Share the love and join me in checking out the other fabulous ladies in our blog hop! C.R.A.F.T., Rain on a Tin Roof, A Stroll Thru Life, Project Inspire(d), The Makers, The Winthrop Chronicles, Home Stories A-Z, Work It Wednesday, Making Home Base, Fry Sauce and Grits, Liz Marie Blog, The Inspiration Gallery, Creativity Unleashed – The Bold Abode, Fridays Unfolded, Remodelaholic, Whipperberry, Tatertots and Jello, Spotlight Saturday and Frugal Crafty Blog Hop.